We take pride in offering exclusive painting and sketching holidays which are fully flexible and tailored to your individual requirements. Our aim is to welcome you to an inspirational, creative yet relaxing holiday, at the same time giving you a taste of the rich cultural, historic and gastronomic heritage of this beautiful region. 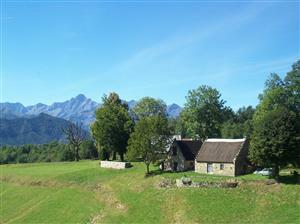 Your base will be situated at an altitude of 800m in the beautiful and tranquil hamlet of Miramont, where the adjoining properties of Le Pichet (named after the traditional French wine jug) and La Carrette (patois for cart) form a perfect centre for exploring and painting this idyllic region, or simply relaxing among the magnificent surroundings. 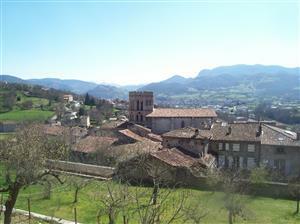 Nestling beneath a castle built by Charlemagne, with the pretty hamlet of Arrous in the foreground, it offers stunning views towards the soaring 3000m peaks of the Spanish border. 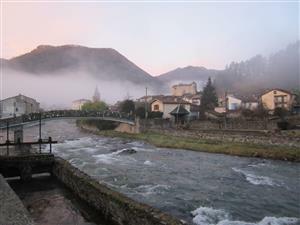 This is unspoilt France at its most authentic. Our Painting courses run from March to late June and from September to late November (excluding Easter and half term holidays). 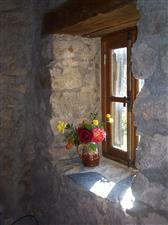 They are ideal for small groups who already know each other and are designed for a maximum of 5 people (not necesarily all participating artists, non-painting friends/partners are welcome) and we frequently welcome couples, families, or individuals wishing to come alone.You do not need 5 people in order to book! Spring and autumn are our preferred times for painting, both in terms of the glorious seasonal colours and because of temperatures, which are much more clement than in summer. In spring you have wonderfully luminous greens as the mountains burst back into life as well as the beauty of spring flowers; while the kaleidoscope of colours in the deciduous woodland in autumn is breathtaking. 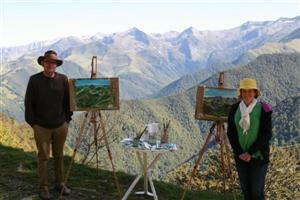 All meals, picnics and beverages on location, daily transport by to a variety of stunning painting locations (including, if wished, one painting-free excursion). Friendly tuition which can be as intrusive or unintrusive as the client wishes, in most media. A full day involves around 6 hours of tuition ( although this may vary slightly depending on the distance to the painting location). 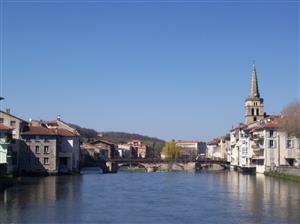 We also transport to and from airports (Toulouse, Carcassonne, Lourdes) and stations at a very favourable rate if required. 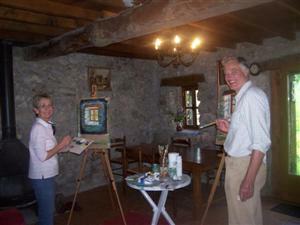 You may prefer to rent the gite with other artists or non-artist friends, do your own catering, and decide on a few days tuition either at Miramont or on an excursion to one of the many painting locations (see prices). Groups with their own tutor are also welcome! The choice is yours - this is your holiday and our aim is to make it a truly memorable one for you, whatever your aspirations. The options are many - please feel free to contact us to discuss your requirements for an individual quote. 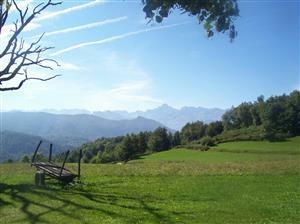 Views towards the higher peaks above Guzet-Neige. We are not far from the Spanish border. Painting (and occasionally sculpting!) indoors. 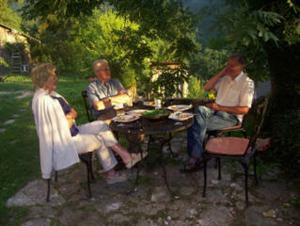 The small size of our groups gives us the flexibility to tailor your stay exactly to your individual requirements. You do not have to book around a pre-designated course or from Saturday - Saturday, rather you can choose your own preferred dates of arrival and departure from the airport of your choice enabling you to take advantage of cheaper mid-week flights . 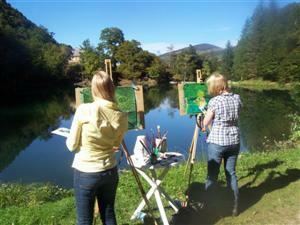 Your stay can be extended (subject to availability) for further painting or non-painting days. Rodney is a talented artist and teacher in most media, so you can choose the materials for your tuition yourself during your designated dates. You may well have your own favourite tried and tested equipment to bring, or we can supply materials at cost, which may be of particular interest for beginners. Particular attention is given to the importance of drawing, and we are delighted to encourage those who wish to try new materials. We provide easels and stools. 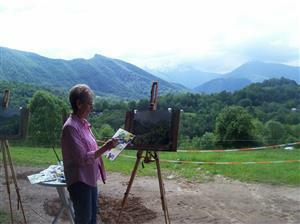 Ariege is a landscape painter's paradise in all its glorious seasons - whether you wish to paint mountains, lakes and waterfalls, or gentler valleys of woodland and pasture, teeming with wildflowers in the Spring. For those fascinated by architecture, Gallo-Roman St. Lizier, mediaeval Foix, local churches and villages such as those perched on the slopes of the Bethmale Valley present many possibilities. 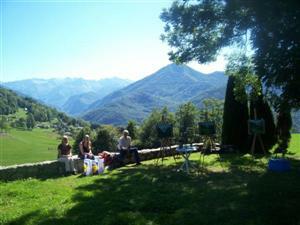 Or you may prefer to capture the atmosphere of the lively Saturday market at St.Girons - or simply stay and paint in the tranquility of the surroundings at Miramont. 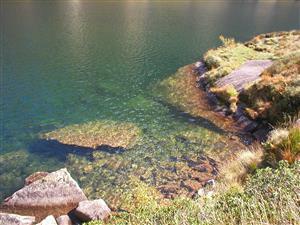 Our daily plans are also flexible- if en route you spot a glistening pool, mossy rock or gnarled old log you'd like to paint, then that is what we will stop and do! 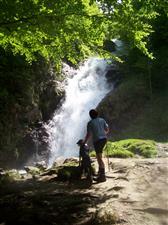 You do not have to book a full-board holiday. One of your party may prefer to cater (for example a non-artist coming with his/her own transport ). Le Pichet has a well equipped kitchen, and Ariege has an immense variety of meats, cheeses, fruit , vegetables and desserts: so cooking here is an experience – and an art - in itself. If you wish to self-cater but do not have the time to shop, we can offer a shopping service for you. 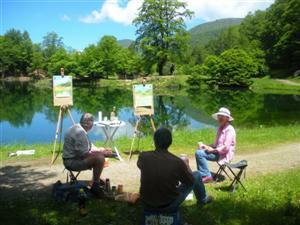 In this case, you may prefer to book gite rental with painting tuition- please contact us for an individual quote. "Thank you again for all your kindness and care. We will miss you and we really hope that one day in the future you will be accepting us again for another amazing painting holiday. Until then we will try to keep painting ourselves. Thanks for everything - the very best wishes." What an amazing week !! 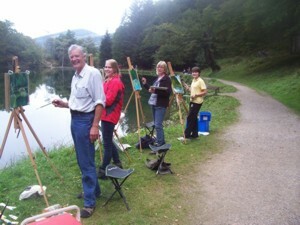 Not only did we improve our painting technique and develop our visual accuracy but also immersed ourselves in the beauty and variety of the countryside. We were completely spoiled by the generosity of our hosts and look forward to continuing our friendship and camaraderie. Thank you dear Rodney, Eleri, Will and Fern for a wonderful holiday. Our time at Le Pichet was without doubt the highlight of our “grand tour”. We are so grateful for your inexhaustible hospitality and Rodney’s wonderful painting excursions and liberal lubrication with wine! "This fortnight has not been just about the charm and beauty of “le Pichet” and it’s surroundings- the marvellous views, walks and delightful evenings spent together-it’s also been about the hospitality, kindness and camaderie of two exceptional people, Eleri and Rodney. They have made our holiday memorable. 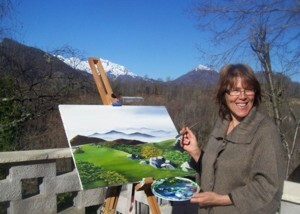 I shall leave Terry to tell of his time painting with Rodney..." Geraldine (Richmond). "Geraldine’s comments are quite consistent with my feelings also. The two weeks here seem like a chapter rather than the few hurried notes that many holidays seem like. Time spent with Rodney in the mountains, ravines and by the water will be valued for a long time- not just for the encouragement and advice about the drawing and pastelwork we did but also for the companionship and generosity. Special. Many thanks to both." Terry (Twickenham). Thank you so much for the wonderful two weeks we’ve had with you and for the kindness and thoughtfulness you have shown. We’ll remember forever the warm, peaceful evenings spent in your beautiful garden, looking out onto the mountains with the sound of crickets in the background. We agree that this has been the best holiday we have had together and hope very much that we’ll keep in touch. 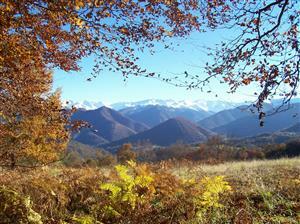 We’ll be thinking about you when we hear about snow in the Pyrenees. 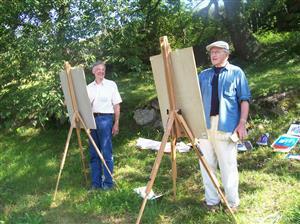 A big thank-you too, Rodney, for the days of painting in the mountains which I believe has sparked an interest in Peter to continue. Marvellous! 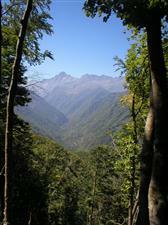 I had no prior experience of the Ariege. This is an area well worth a visit. But le Pichet more so. 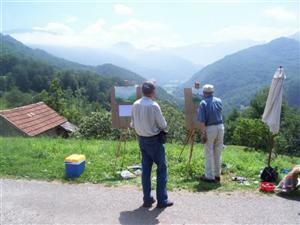 Away from the world and in the midst of spectacular scenery, ideal for walking/driving and of course honing painting/sketching skills. What makes a stay here even better are Eleri, Rodney and William. Nothing is too much trouble. We have thoroughly enjoyed ourselves here and the week has flown by. Thank goodness we drove down from the Channel in one day and added a day to our stay. The market in St Girons is also a delight. Thank you all, and your hospitable friends, for a wonderful stay.